We had our first snowfall this past weekend. The snow that fell covered the trees with a nice frost. I went outside to capture some images before the weather melted the snow. I like this photo because I used a large aperture value F/22 to get the sunburst effect. 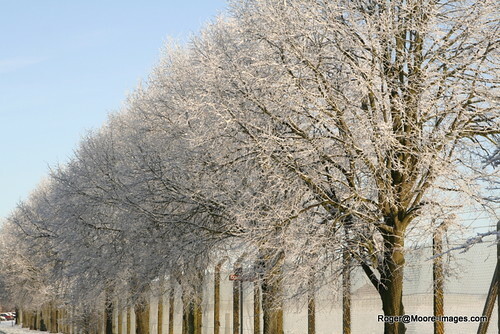 This image shows the frost on a row of trees. If you want to see the remaining images, please check out my Flickr site. I know the weather may be cold. 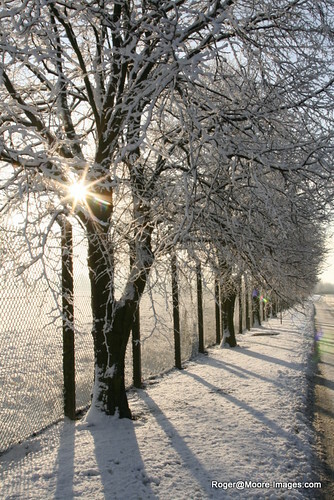 However, take the time to capture the fleeting images that only winter can provide. That first photo is tight! I also enjoyed the photo with the sunburst effect. What I like most about the first one is the blend of high key and mid key. Arresting! nice photos!!! the quality is awesome!!! you are really getting a true knack for the photography!! AS ALWAYS, YOU’RE THE MAN. WHEN ARE YOU GOING TO GO FULL TIME IN THE PROFESSION? Great photos! I’m waiting for the day when you get that first contract with a well known publication. Nice winter wonderland photos Mr. Moore! That’s some real attention to detail(s) between the top and bottom photo; it would have been difficult for me to have noticed the differences had you not pointed it out. I am loving the all the winter pictures but the first picture is definitely my favorite. I love that caption of the sun.